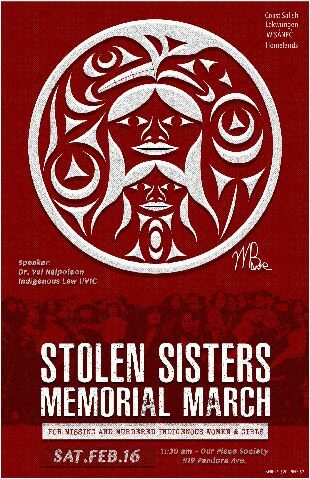 On Saturday, February 16th, 2019 we will gather on the un-ceded and traditional territories of the Lekwungen communities (Victoria, BC) for the annual Stolen Sisters Memorial March to honour the memories of all those Indigenous women, girls and two-spirit people who have gone missing and been murdered. We walk in unity to support and hold up their families, loved ones and nations through this loss. In this way we remember and show the strength of our love for our relations.